Want to connect to a HDTV/Network, but your Macbook Pro or other USB-C devices lacks a HDMI/Ethernet port? With AHNR 9-in-1 USB C Hub, you can easily solve all the annoyances. Sync an entire workstation together with a single compact hub. Turn your Mac Pro into an all-in-one connectivity station for USB, HDMI, SD/TF, Ethernet and Audio/Mic Jack. Sync and manage your files faster than ever. Slim and compact design , EMI Interference Free. The USB C adapter dock has ultra slim design (12*4.3*1.5 cm) and 2.5D Unibody Aluminum Alloy case, it helps dissipate heat better and faster. ☞[4K HDMI OUTPUT] Mirror or extend your screen with HDMI port and directly stream 4K UHD (3840x2160@30Hz) or Full HD (1920 x 1080@ 60 Hz) video to HDTV, monitors, and projectors. ☞[SUPERSPEED DATA SYNCING] 3*USB 3.0 ports allow data transfer rate of up to 5 Gbps, fast enough to transfer an HD movie in seconds. Built in SD and TF slots easily transfers files from SD/TF card to your devices at a speedy 5 Gbps. 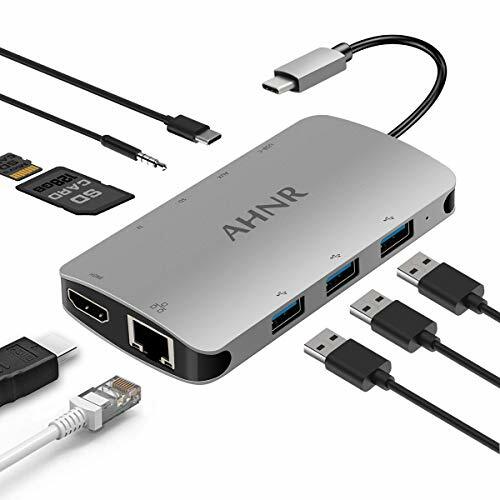 ☞[More Reliable Than Wi-Fi] AHNR Adapter offers full superfast gigabit ethernet performance over the RJ45 ethernet port.Nothing beats a more stable wired connection with AHNR LAN adapter when you are streaming videos or playing online video games. ☞[Our Worry-Free Warranty] AHNR USB C HUB is backed with 12-Month product replacement Warranty and friendly customer service.If your type c hub does not work,please feel free to ask us for driver. If you have any questions about this product by AHNR, contact us by completing and submitting the form below. If you are looking for a specif part number, please include it with your message.